A leading indicator of consumer spending, consumer confidence, declined in January. Consumer attitudes toward current business conditions remained favorable for economic growth, the Conference Board reported, but expectations eroded because of the year-end stock sell-off and the federal government shutdown. The business research group said it considered the lower confidence as more of a temporary shock than a precursor to a significant economic slowdown. Consumer spending generates about two-thirds of U.S. economic activity. Another sign of weaker housing was a report by the National Association of Realtors that its index for pending home sales declined 2.2% in December. The indicator was down 9.8% from its December 2017 reading, marking the 12th consecutive year-to-year decline. An economist for the trade group blamed higher home prices as well as year-end stock declines and a temporary rise in mortgage rates. Suggestions that the Federal Reserve is easing its increases in interest rates should help 2019 sales, the economist said. 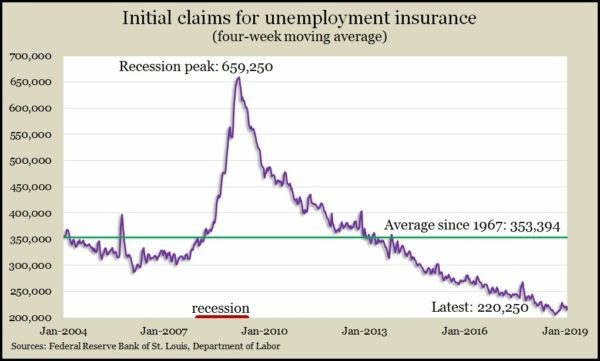 The four-week moving average for initial unemployment claims rose for the first time in three weeks, though it stayed 38% below the long-term average. Labor Department data reveal claims have remained below the 52-year average every week since early 2013. The measure suggests persistent reluctance among employers to let go of their workers. That should push up wages and encourage more consumer spending. The first Commerce Department report after the government shutdown was a rise in new home sales in November. The annual rate of sales grew 16.9% from October to 657,000 residences, which was 7.7% behind the November 2017 pace. Sales rose to their highest level since March and marked the first time since May that they outpaced the rate heading into the 2008 recession. U.S. employers extended the record for consecutive months of job gains by adding 304,000 more jobs in January. The net increase exceeded the 12-month average of 223,000 jobs. Hiring in January was above average in leisure and hospitality businesses, construction, health care and manufacturing. The Bureau of Labor Statistics said the unemployment rate rose to 4% from 3.9% in December, largely because of temporary layoffs from the 35-day federal government shutdown. The partial shutdown also helped account for an 11% rise in involuntary part-time workers. Average hourly wages rose 3.2% from the year before, the fourth month in a row of plus-3% wage increases, which hasn’t happened in a decade. The University of Michigan said its consumer sentiment index fell to 91.2 in January, up slightly from a preliminary mid-month estimate but down from 98.3 in December. Opinions about current economic conditions declined, although at a relatively high level. Expectations fell even more, in part because of diminished optimism toward future job gains. An economist with the survey said consumer spending was on pace to grow by a healthy 2.6% in 2019 but added that additional “crisis” events such as the government shutdown could chill consumer activity. The U.S. manufacturing sector grew at a faster pace in January, signaling 29 months in a row of expansion. Components for new orders and production both picked up pace from December, according to the Institute for Supply Management, while hiring slowed. Purchase managers surveyed for the index reported a continued growth in exports but at the weakest pace since the beginning of 2016. The trade group said based on past data, the January index suggests economic growth is on a 4% annual pace. In another report delayed by the shutdown, the Commerce Department said November construction spending rose 0.8% to an annual pace of nearly $1.3 trillion. The rate was up 3.4% from November 2017 and was the first monthly increase since July. Residential construction, particularly multi-family housing, led the monthly gain. Year-to-year, the boost in construction spending relied on transportation developments, amusement and recreation facilities, lodging and water supply projects.